Janakalyan Primary School, on edge of mountain, with bare walls, rough floors. The ceiling leaks rain and snow. In playtime, some children fall down the mountain and die. 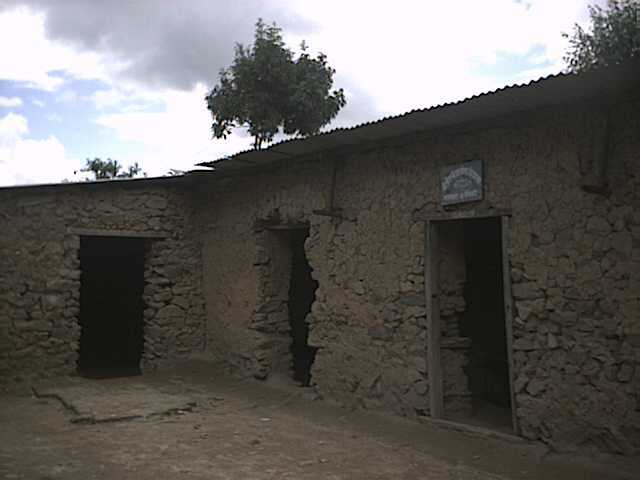 Tauthali Primary School, with no windows or doors. Mountain goats, birds, and water buffalo enter classrooms at night. They leave behind droppings and a horrid smell. In August 2001 I cried. I cried in Nagarkot, Nepal, at the dilapidated state of the huts called schools. I cried at impoverished school children with no blackboard, chalk, pencils or paper, repeating words like parrots because there was no other way to learn. And I cried at how one headmaster had saved for years to buy a buffalo, and now wakes at 3am daily and walks miles through the mountains to sell buffalo milk to pay for basic school items like another teacher. Until then, after he's sold the milk, he teaches everything himself. The tragic situations touched my heart. I felt my heart well up, then swell up, and I swore then and there to help all the schools in the area. Nagarkot would be a beautiful area if it were not for the poverty. Situated on a Himalayan ridge, on one side it overlooks the Valley of Kathmandu. The city's lights twinkle in the distance at night. On the other side are the highest Himalayan peaks, including Mount Everest, always snow-capped. But my time in Nagarkot was not spent in idle sightseeing. It was spent mobilising local support within the seven local ‘schools’, from the area’s nine village chiefs, and from the Villages’ Development Chief. By the time I left, visits had been made to schools to ascertain needs. One school's poor children were crammed into small, filthy, crumbling classrooms because new partially built classrooms had run out of funds. They only need £500 to finish the work. Another school had 200 students, but only four pencils between them. This did not really matter, as they had no paper to write on. 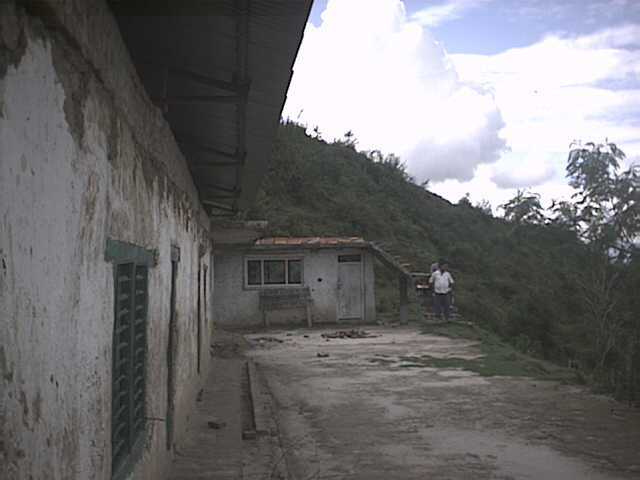 Two other schools were situated about halfway up a mountain so that children from villages in the valley far below, and the ridge way above, could all attend school. There were no real paths, only roughly hewn footsteps in steep mud or rock, with often a sheer drop on one side. The path is highly dangerous, especially when wet, and children on their way to school had slipped off the mountainside and died. These tragic circumstances increased because schools had no games, no ball, and no skipping rope or coit, nothing except stones to play with. At one school, children played musical chairs, to a tune of the teacher’s humming. But the school had no chairs. So bare-footed children stood on rough stones. There are too many horrid things to relate. Suffice to say, seeing the schools and ascertaining needs was followed by discussions with the area’s Villages Development Chief, Mr Bill Bahadur. He agreed to call a meeting with the Chief’s of all nine local villages, with the objective of raising villager support for a planned Schools Development Programme. Provide labour from their pool of unemployed tradesmen. Set up individual parent-teacher School Management Committees with one committee over all, to ensure monies are well spent. Send girls to school, instead of sending them to work hard on the mountain slopes from the age of three). As an initial agreement, the outcome was successful. Before leaving, from personal savings I bought enough basic play and school items such as footballs, coits, skipping ropes, blackboards, chalks, exercise books, pencils and rubbers for each child in each school. Each pound buys perhaps 10 times more than in England. Let’s wipe away the tears from Nagarkot’s visitors. My travel fares to visit the Schools in Nepal come out of my pocket. 100% of your donations helps children's education.Come with me if you wish, and see the suffering you'll relieve.